We are proud to have some of house music’s finest names lined up shoulder to shoulder. BiG Al is the man behind Ready Mix Records, Haute Musique, Tiny Lamp, StereoTrip, Itom Records and Empty Whisky Flask Records. He is the founder and partner in Beat Factory, Audio Lab, The Suppliers, Harlem Knights and Soul Collective and has also seen his music released on GU, Baroque, Armada, Plastic City and King Street to name a few. 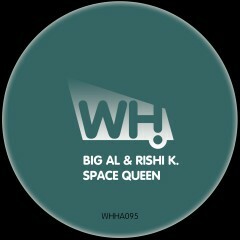 He teams up with Rishi K. from San Francisco who is profilic both in the quality and quantity of his releases. Blue Orb Records, UM Records, I Records, DeepClass, Dutchie Music and Savoir Faire Musique are just a few of the high profile labels he has recently worked with. The list goes on and on. Together they bring us their mind blowing deep house cut called Space Queen. What Happens main man Tim Andresen provides the excellent slightly chunkier and more hypnotic remix, making this a release not to be missed.